In honour of St Patrick's Day, this week's column has a decidedly green tint. Green is the colour of balance, harmony and growth - so what better colour to represent our nation? Of course, 'green' is also the biggest buzzword in beauty for 2019, but since I've covered eco-friendly products at length in recent weeks, today I've chosen to have a bit of fun with the verdant beauty offering below. One cailín who is invested in green living is food writer and model Roz Purcell. She has recently signed up as an ambassador for Revive Active, the Galway-made line of natural food supplements, and begins every day with its energy-boosting Zest Mineral Complex. The other Irish products that have become go-tos in Roz's beauty arsenal include Carter Beauty's eye-shadow palettes, Blank Canvas brushes and Waxperts' Wonder Pads and Beautiful Body lavender body oil. Branching out, she is also a big fan of Image Skincare's daily moisturiser with SPF, Chanel's Soleil Tan, Elizabeth Arden's Eight Hour Cream and Benefit's Benetint stain for lips and cheeks. Roz's top beauty tip is to stay hydrated. As the owner of probably the most famous pout in the country, she tells me that she notices "a huge difference in my skin texture, especially on my lips, if I don't drink enough water." Water is certainly something we have plenty of in Ireland, but let's hope we don't see too much of it coming from the sky this Bank Holiday weekend! Quench thirsty skin with The Body Shop's Cactus Blossom Body Range, €8.50-€24.95. Enriched with nourishing cactus flower extract from Morocco and Community Trade shea butter from Ghana, the products are ultra-fresh. Moisture-stripped skin will thank you for this shot of green hydration, leaving your body feeling softer and more supple. From Body Shop stores nationwide. To minimise redness, the appearance of rosacea and unwanted ruddy undertones (a common issue with Irish complexions), use a green-toned primer. If you used 'green cream' as a teen, you may remember them as a little chalky and hard to absorb, but today's primers are silky on the skin and also fill in fine lines. Use Elf Tone Adjusting Face Primer in Green, €9, over clean skin before applying foundation. Pump out a small amount and blend evenly with your fingers over the face and neck for a smooth make-up base. From pharmacies nationwide. A green lipstick?! Bear with me here, I'm not actually recommending a green lippie - no matter how patriotic you are feeling this St Patrick's Day! This emerald green lipstick magically transforms to a shade of pink uniquely matched to the wearer. The green instantly reacts with your lips' warmth and pH, to create a rosebud shade that will look different for every wearer! 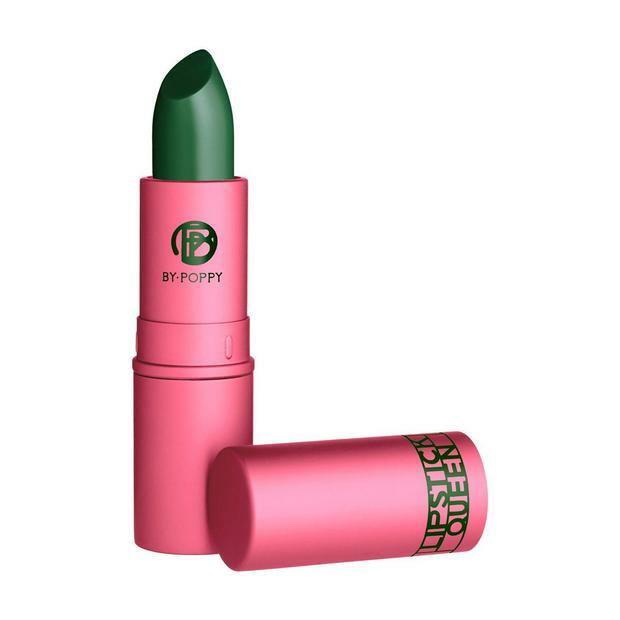 Lipstick Queen's Frog Prince, €25.50, is perfect for anyone not madly keen on a strong lip, but still looking to enhance the natural colour of their lips. It's also available in a blush, €26, that acts in the same way on cheek colour. From Debenhams and Space NK. For lips that say 'Kiss me I'm Irish' try Essence's Holo Wow Dewy Lip Shine in 05 Fairy Dust, €3.40. This is a fun, holographic-finish lip gloss, that you slick over your usual lippy to give just the faintest emerald glow to your pout. To add an emerald tone to your eyes without any faffing about with tricky-to-master eyeshadow blending and contouring, use a slick of a green eyeliner. Try Catrice Kohl Kajal Eyeliner in Green, €2.30, from Penneys stores and pharmacies nationwide. If a grown-up nod to St Patrick's Day is what you're after, try a green-toned mani. I like Essence's Shine Last Polish in Everybody Say Yeah, €1.95, from Penneys stores and pharmacies nationwide. A new offering that's gorgeous on all eye colours, NARS Matcha Eyeshadow, €22, is a green eyeshadow that is super subtle with just the faintest wash of light moss green tones. From Brown Thomas and Arnotts. This new perfume is inspired by the wild, green grasses that grow in the heart of Provence. Herbae par L'Occitane, €65-€89, is a gorgeous green, fresh and herby fragrance that smells like a stroll through the forest! From L'Occitane de Provence stores and department stores nationwide. Klorane is a French botanical hair care company that you should definitely have on your beauty radar. Its ethos is that there is one plant for every specific concern - and if you suffer from oil-prone hair, their answer lies in the power of green nettles. Try the Klorane Oil Control Shampoo with Nettle, €11.50, available from next week at pharmacies nationwide.